LCD-Solar-Computer compatible with all VOTRONIC Dual MPPT Battery Controllers. How much residual charge does my battery have? Is the battery state really “Full”? Why is energy taken from the battery, although the consumers had been switched-off? 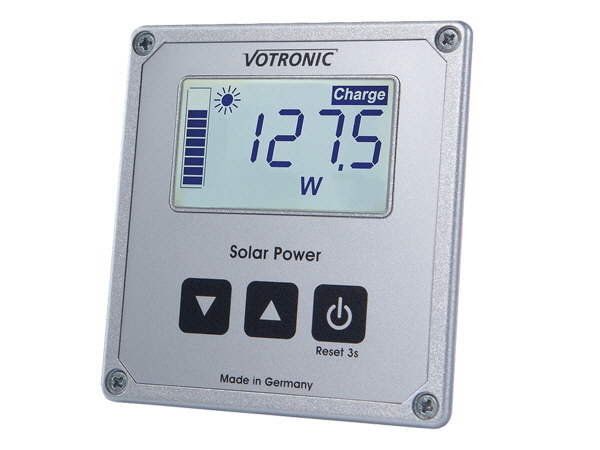 The VOTRONIC LCD Battery Computer S gives the answer to these questions - exactly to the percentage (%) and ampere-hour (Ah). At the touch of a button, it informs comprehensively of the instantaneous charging state of the battery, the flowing battery current rates, as well as the voltage situation of the battery. Based on the proved VOTRONIC LCD Battery Computer, the LCD Battery Computer S had been developed. The various display functions and the high operating convenience had been extended by a neatly arranged LCD display with white background illumination, which offers excellent legibility, even from a distance and with unfavourable lighting conditions. Since the unit is permanently in contact with “its battery”, it records and evaluates all battery actions. All charging and discharging currents are counted accurately. Battery size, self-discharge, battery load etc. are considered by programmed characteristic diagrams. Even the smallest leakage current is detected and recorded. The residual capacity of the battery is calculated from the measured values and the battery size. The result is a correct indication of the charging state (of the capacity, which is still available, the residual charge) of the board battery as numerical value in Ampere-hours (“Ah”) and as percentage (“%”), as well as in form of a clear level bar, like a fuel gauge. The LCD Battery Computer S is suitable for all battery types (acid, gel, AGM, lithium adjustable) with 12 V and 24 V battery voltage.